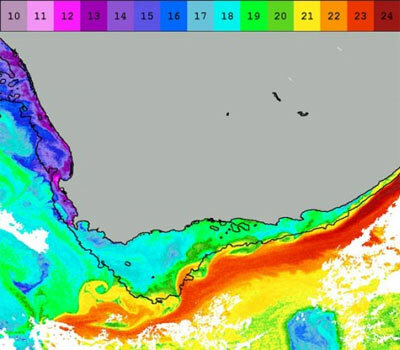 The climate on the SW coast of South Africa is considerably cooler than the East Coast of South Africa.The chilly Bengula current from the Antartic prevents even summer water temperatures from rising beyond 15Deg C from the Cape of Good Hope north to Nambia ensuring moderate warm air temperatures in summer along the coastline despite the intense sun shine in summer. This is compensated in Oct – Mar by stable high pressure systems south west of the continent that supply the region with its awesome high South Easter winds. The South Easter, commonly known as the Cape Doctor or Flying Dutchman blows through in the Cape region, its pulled south and inland along the west coast by the rising summer heat until it finally blows SW by the time it reaches Nambia. The wave supply is also nothing short to scoff At, as proximity storms produce massive rolling swells and have recorded swells running for almost 100m in places like Jeffery’s Bay. The waves along the South African coast produce year round quality swells from the Antarctic, mostly SW – perfect for the coastline’s orientation. Wintertime brings the biggest waves, but the low pressure system brings cloudy weather, and the NW winds along the west coast are unpredictable and are often followed by cold fronts or even squalls. The Agulhas Current from the tropics warms the water temperatures to over 20Deg C. The Overberg region in the Southern cape region get supplied with SE wind by high pressure systems. The further north the same high pressure causes NE winds around Durban mostly from Aug – Feb.These winds often leave the sea churned up and choppy and often brings the Portuguese man o war (Blue Bottles) The cold front in summer pushes up SW winds from Cape Town up the coast giving rise to some of the biggest blistering swells any surfer could dream of. Neighbouring Mozambique’s summers are consistently warm at 30 deg C and water temperatures are warm all year round. The further north you go the winds tend to follow the trade winds which generally are between May – Nov. The waves along the east coast of Africa ear the equator seldom get really big. The best wind swells are created during Cyclone season.